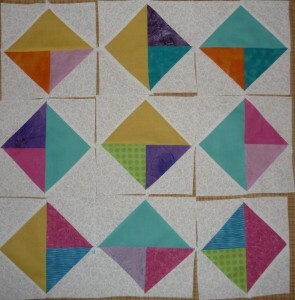 Here are my 9 blocks for April.I used the 4 at a time by 2 plus one from a large half triangle left over from who knows. My block to Charlene and Cathy made it to the post yesterday and cost me $2.60 each. Your blocks pushed us past the 100 block total-so-far this month. Hi Margaret your blocks are so cheerful…just looking at them made me smile! Thank you for mailing out your Block to me …I am so excited to have Won and I can hardly wait to see them all together! Have a Sweet Day tomorrow and smile …a lot!